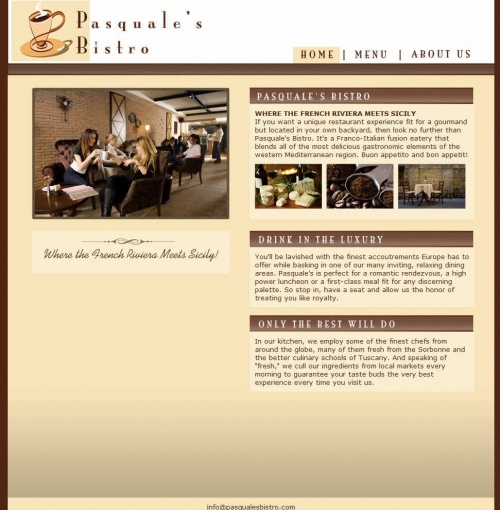 Found through the second episode of Gotham Tonight, Pasqualesbistro.com is the website for a Gotham City restaurant. If you want a unique restaurant experience fit for a gourmand but located in your own backyard, then look no further than Pasquale's Bistro. It's a Franco-Italian fusion eatery that blends all of the most delicious gastronomic elements of the western Mediterranean region. Buon appetito and bon appetit! You'll be lavished with the finest accoutrements Europe has to offer while basking in one of our many inviting, relaxing dining areas. Pasquale's is perfect for a romantic rendezvous, a high power luncheon or a first-class meal fit for any discerning palette. So stop in, have a seat and allow us the honor of treating you like royalty. In our kitchen, we employ some of the finest chefs from around the globe, many of them fresh from the Sorbonne and the better culinary schools of Tuscany. And speaking of "fresh," we cull our ingredients from local markets every morning to guarantee your taste buds the very best experience every time you visit us. Les Pommes Frites du Salvatore -The classic French fry, reinterpreted and reinvented. Re: money laundering probe, a buddy of mine in Western confirmed that bistro story -- there's some bad guys going in and out of that place, usually the back. Let's talk next actions -- surveillance? Stake out? It's your call here. Pasquale Caliolo is one of the most upstanding, respectable business owners in Gotham. Even though he recently expanded his operation to over 100 tables, he still treats all of his customers like members of the family. "I felt like I was back in the old country," praised one happy customer. So, call or e-mail us today - a great meal is just a reservation away. Thank you so much for contacting us here at Pasquale's Bistro. Our computers have been down for quite some time, as we have been renovating the establishment to better suit your needs. Sorry for the inconvenience. If you would like to make a reservation, please call us at (877) 678-7277. Grazi, merci and thanks again! Hello and thank you for calling Pasquale's Bistro. We are either on the other line or we are busy making the most delectable French/Italian meals that Gotham has ever seen. In any event, leave a message at the tone. Please leave your message at the tone. If you are an administrator enter your 5-digit PIN. Hey, Frenchie - me and, uh, Rosolio ain't gonna to make it to, uh, Sunday Night Crepefest. Something came up - in the Gotham River. I think his name was...Fred. Anyways, we'll be there Monday night for our 'box of pastries.' Baker's dozen this time, capiche? A .wav file of the message can be downloaded from Zshare here. The Joker notes that "They tried to reschedule their pick up service at Pasquale's, but things didn't go according to plan." A GPD MCU surveillance wiretap proves that both men were violently assaulted at the bistro that day, very possibly killed. After the countdown ended on Whysoserious.com/Overture, Pasqualesbistro.com was "Jokerized," along with nearly every other website in the game. This page was last modified 01:15, 12 July 2008.